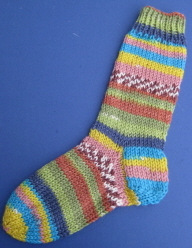 Dk socks for baby in sizes 0-3 motnhs, 3-6 months and 6-12 months. 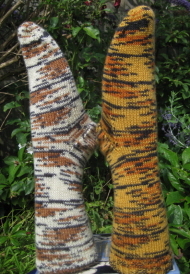 Kit includes Knitcol yarn, as set of double-pointed needles. a stitch marker and the pattern. 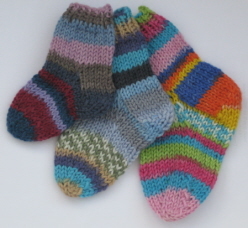 Kit to knit children's socks in shoe sizes 7-3 to fit children from 3-9 years. 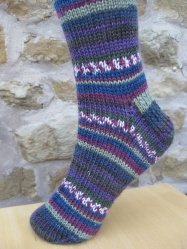 These thick socks are great with boots and wellies. 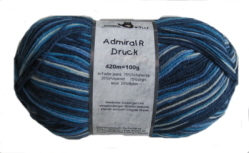 Kit includes Knitcol DK yarn, as set of dpns, a stitch marker and the pattern - all in a handy project bag. This kit contains 2 x 50g balls of Knitcol double knitting yarn, a set of 3.5mm bamboo dpns, stitch markers and a pattern - all in a handy PVC project bag. Two balls of yarn are sufficient for adult socks up to shoe size 8. 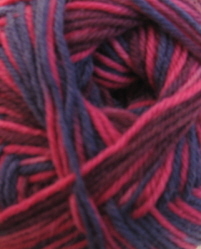 You may need an additional ball of yarn for larger socks.